Former Emir of Qatar, Hamad Bin Khalifa Al Thani, whose brother Mohammed was involved in Kaupthing Bank’s market manipulation controversy. DE-Tenants.org is researching the business transactions and holdings of the Qatar Investment Authority and Qatari elites – particularly the country’s ruling Al-Thani family. 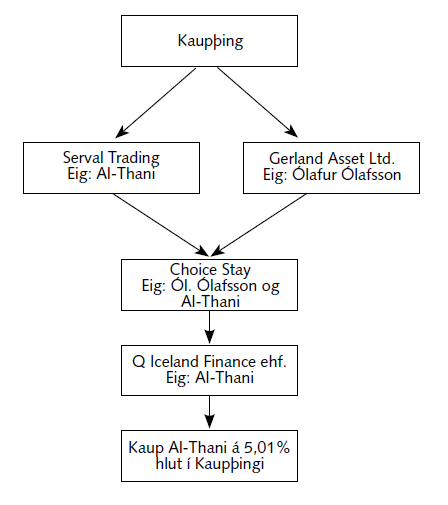 Previously (Part 1), we detailed how Qatari royal and longtime government official Mohammed Bin Khalifa Al-Thani in the fall of 2008 (amidst the global financial crisis) invested in the Icelandic bank Kaupthing. Today’s post details how Al-Thani had in fact invested in the bank with loans provided by Kaupthing. 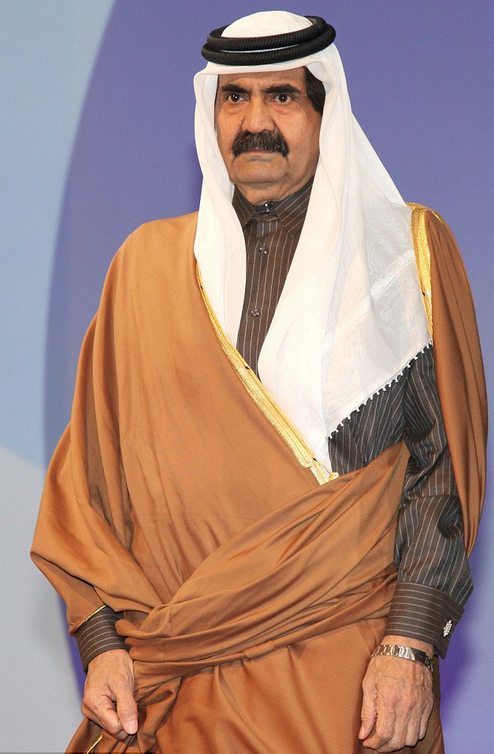 Mohammed Bin Khalifa, however, was not investing his own money in Kaupthing. 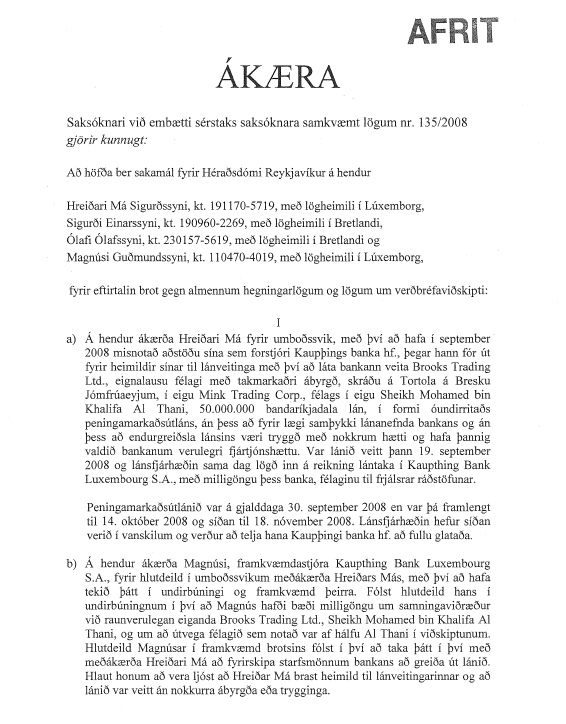 Instead, while investors believed Al-Thani funded the stake, he actually took the position using money loaned by Kaupthing, according to the determination of a subsequent parliamentary commission (Skýrsla rannsóknarnefndar Alþingis, Volume IV, Chapter 12). Many jurisdictions including Iceland deem it an unlawful form of financial assistance for a company or bank to lend money specifically for the purpose of buying its own shares.‎ Such a move allows an institution to prop up its share price and mask weaknesses that could lead to a run on its stock (SOURCE). As an example, Britain’s Serious Fraud Office (SFO) indicted four Barclays bankers in June 2017 for unlawful financial assistance for another 2008 transaction involving the Qatar Investment Authority and the Qatari prime minister Hamad bin Jassim Al-Thani (“HBJ”). The Barclays case bears similarities to the case of Kaupthing’s market manipulation. In short, Mohammed Bin Khalifa did not use his own wealth to invest in the bank. The specifics of the transaction were complicated. Per a March 2012 indictment issued by the Office of the Special Prosecutor (in Icelandic) detailing the nature of a September 2008 transaction. (An image of the indictment is pictured to the right.) Mohammed Bin Khalifa – who was not prosecuted – did not risk his own money to buy the shares, but instead used funds provided by the bank itself through a series of complicated loans. Secondary English-language reporting on the indictment and the transactions can be found HERE and HERE and HERE. The explanation below is built on the March 2012 indictment in Icelandic as well as secondary English-language reporting, including that of an Icelandic journalist named Sigrún Davíðsdóttir. Ms. Davíðsdóttir’s English-language reporting on the Kaupthing controversy was cited by The Guardian. She has written for Politico Europe, The Financial TImes, and Reykjavik Grapevine. She has worked on behalf of the Export Council of Iceland (Útflutningsráð Íslands) and the Icelandic Broadcasting Service. According to the prosecutor, on 19 September 2008, Kaupthing’s CEO Hreidar Mar Sigurdsson arranged that a dollar-denominated loan of US$50 million be paid into a Kaupthing account belonging to Brooks Trading Limited, a British Virgin Islands (BVI) company owned in turn by another BVI company called Mink Trading Corp. Mohammed Bin Khalifa Al-Thani was the beneficial owner of both firms. Mink Trading, per records from the Panama Papers, links to an address at the Al Shahaniya horse racing track in Qatar which is owned by Mohammed Bin Khalifa. Sigurdsson bypassed the bank’s credit committee and was, according to the bank’s own rules, not allowed to authorize a loan of this size on his own. The loan to Brooks Trading was without guarantees and collateral, and the Brooks Trading loan was never repaid. The CEO of Kaupthing Luxembourg, Magnus Gudmundsson, organized the payment to Brooks Trading. According to the indictment charges, Gudmundsson should have been aware that Sigurdsson was going beyond his authority by instigating the loan. “Sheikh Sultan Al-Thani” is assumed to be the same “Sheikh Sultan Bin Jassim Al Thani” linked to Q Iceland Holdings, per the parliamentary commission Volume IV, Chapter 12. From Choice Stay the money went into another Kaupthing account, held by Q Iceland Finance, owned in turn by Q Iceland Holding. Mohammed Bin Khalifa was the beneficial owner of both of these firms. It was Q Iceland Finance that then bought the Kaupthing shares. The flow of funds is depicted in the image to the right, taken from the parliamentary report (page 81). The four men were convicted of crimes in Reykjavík District Court on 12 December 2013 in case no. S127-2012 (warning: 71MB PDF). Subsequently they appealed only to have their convictions largely upheld (and some of their sentences expanded) in Iceland’s Supreme Court, on 12 February 2015 in case no. 145-2014. We will discuss these legal cases in the next post of this series. Mohammed Bin Khalifa was never accused of a crime. However, he was accused, wittingly or not, of participating in a scheme to prop up Kaupthing’s share price and mask weaknesses that could lead to a run on the bank’s stock (SOURCE). The Office of the Special Prosecutor told the Financial Times that Sheikh Mohammed Bin Khalifa had assisted the inquiry by answering questions, although he never testified. In his statement to the prosecutors, Mohammed Bin Khalifa said he did not know of any direct involvement by Olafsson to the deal. Al-Thani’s lawyers said he considered himself to have been deceived. However, the convoluted deal involved two of Olafsson’s firms—Gerland Assets Limited in the BVI and Choice Stay Limited in Cyprus. And Mohammed Bin Khalifa was a beneficial owner of the Cyprus company, Choice Stay Limited, along with Olafsson and Sheikh Sultan Al-Thani, according to the indictment. Kaupthing’s winding-up board charged with managing the failed bank’s estate made unspecified claims against Mohammed Bin Khalifa for his role in the Kaupthing affair. The estate settled the dispute with Mohammed Bin Khalifa in February 2013 after agreeing a confidential settlement with him. No details were provided. Notably, the settlement with Al-Thani came ten months before the convictions in Reykjavík District Court in December 2013. In the next post of this series, we will discuss the legal case of the four Kaupthing bankers.